Recently at the Cloud Connect event in San Jose, Randy Bias, co-founder of cloud builder Cloudscaling gave a fascinating talk which sought to dispel many of the myths around enterprise cloud computing. Bias’ talk is an excellent way to spend ten minutes – I’d recommend watching it below. Cloudscaling is an organization that has been building some of the worlds biggest clouds and it was great to have someone peel back some of the covers around the economics involved with that. I caught up with Bias last week and took a very deep dive into some (unfortunately private) information that he uses to differentiate between “traditional enterprise clouds” and the commodity clouds that Cloudscaling has been building customers. Part of Bias’ argument lies in what he says as a dual battle that is going on. On the one hand public cloud providers (Amazon, Rackspace etc) are fighting over the greenfield opportunities within enterprises. This is the traditional cloud adoption discussion, that new apps will go cloud, while traditional will remain on the infrastructure they already sit on. Bias also contends that there is another (albeit slower) shift of existing apps moving to enterprise public clouds. The battles that Bias sees going on are between Amazon and the other big public cloud providers for greenfield apps, and between enterprise cloud providers and builders of commodity cloud products. Bias asked the audience when the enterprise cloud product would come that proved the enterprise cloud model in the same way that AWS proved the public cloud model. As a side note, Bias told me about a customer he’s done some work with who had a serious business falling out with a large traditional hardware vendor. That vendor went back to the customer on bended knees offering rock bottom pricing just to get back into the game. 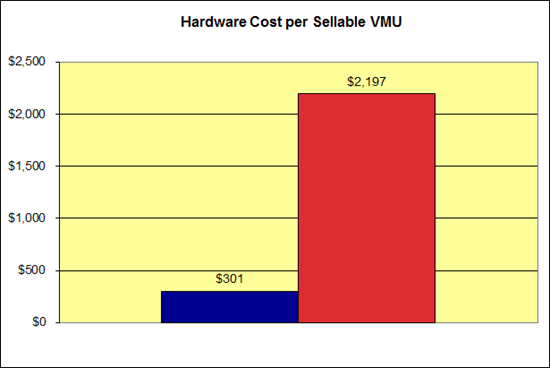 Even at special build and rock bottom pricing, the hardware delivered 25% of the performance at three times the cost of tuned commodity hardware matched with OpenSource software. Surely that’s validation for the approach that Bias is encouraging. Let us not wage wars on terms like Enterprise Cloud and Private cloud. As far as I care, it’s all semantics for some infra optimization. #cloud is confusing enough for most already — we don’t need new terms to help hw vendors peddle their wares. I entirely understand Krish’s and Sam’s perspective – while those of us within an inner circle argue semantics, an entire industry stands by somewhat dazed and confused by the oftentimes conceptual discussions going on. Unfortunately however in the light of what can only be called FUD on the part of more traditional vendors, it is natural that those building clouds in the most efficient (read cheapest) of ways, fight back against some of that spin. The most telling statistic of all, and one that perhaps justifies Bias’ crusade, regardless of any collateral confusion it may cause, is the following one. This diagram depicts the relative costs of building a private cloud. The blue figure uses commodity hardware and OpenSource software, the red figure, some 7x more than the preceding one, utilizes “trusted” providers of hardware along with proprietary software. Great post Ben. You know I am an unabashed sucker of commodity clouds. However, my experience talking with enterprise IT made me realize that they are not just considering the cost factor alone. Many of the IT managers are more worried about protecting their jobs and these guys are not going to go the commodity route any time soon. Plus, not every enterprise developer is interested in writing code for hardware failures. As long as these concerns linger (which is not going to go away anytime soon), there will be a category called enterprise clouds. It is a transitionary step for enterprises. We cannot expect them to decide one day in favor of commodity clouds and go with it. It doesn’t seem like you watched the original video or perhaps even read the presentation or follow on blog postings, Krish. There is a danger in lumping all “enterprise IT” together. There are two key constituencies: centralized IT/infrastructure and the dev/apps folks. While centralized IT/infra does feel threatened, the dev/apps folks are largely adopting commodity clouds because of their low cost and friction point. It’s the *exact* same sale as Salesforce.com/SaaS. I am certain you know this. Enterprise developers faced with the choice of waiting for centralized IT to get their act together vs. get going today will choose to get going today as then their destiny is under their control. This is well established. In that vein, today’s public “enterprise cloud” providers are terrible options as they require high minimum commitments (2K+/month) and are focused more on sales to centralized IT/infra. I have fairly good inside information on adoption rates at Sungard, Savvis, Terremark, and a number of other ‘enterprise’ clouds and they suggest that adoption is very very low. As I said in the presentations, these enterprise clouds are focused on selling to IT/infra who, as you said, are threatened by these very clouds. What then is the motivation to outsource your job? I want to point out again, per the video and deck, that my definition of an “enterprise” cloud is based on it’s characteristics, not placement or tenancy model. It does not imply ‘private’ (single tenant) or ‘internal’ (behind the firewall). It is a statement of how clouds are built. In my direct experience and with a mound of supporting data, enterprise-style clouds are currently failing to attract adopters. Yes, there are a few bright spots. Yes, there is a ton of spending. Regardless, spending and a few places where it’s not a disaster does not equate to success. Also Ben, if pricing is the only issue why did AWS come out with dedicated instances which are not cost effective compared to their cloud offerings (I am intentionally not calling dedicated instances as cloud)? I am not saying Randy is wrong. As a practitioner, he can do it because it comes under marketing talk but as an analyst, I cannot do such evangelism and I have to take into account buyer side concerns and realities about cloud services. Cloudscaling is certainly a business, but has a well established reputation for providing ‘real deal’ information. I’m not saying we don’t spin or market, but the way you position the above statement makes it sound like your viewpoint is inherently ‘more true’ because you are an ‘analyst’. Of course, as an ‘analyst’ you are selling your analyst services in one way or another as well, right? Bottom line is that as an analyst you are no more correct or right than I am based on your ‘role’ in the cloud ecosystem. Please leave assertions like that out of this conversation and argue on facts only. Secondly, to address your specific issue, no one in this discussion mentioned pricing. I talked very specifically about the cost side of building a commodity vs. enterprise cloud for which I have very deep and detailed data. Neither myself nor Ben made an argument that “pricing is the only issue”. You brought this up. And to point #3 I actually haven’t seen any data to support such an assertion either. Finally, I think you have misread the Dedicated Instances #s. AWS charges $10/hr *total* for an entire AWS region no matter how many instances you have. This basically means $7200/month for the privilege of making certain your instances are running on dedicated servers. Certainly this is ‘not competitive’ if you need only a few. However, it you are a large AWS consumer and spending > 72K/month in service charges, it’s >10% overhead. In other words, AWS is providing additional security (no shared hypervisor) for large customers who might normal go to an enterprise cloud provider for just 3x what the usual minimum commitment is from a large enterprise provider. I would call that pretty fantastic value overall. Ps. Dedicated instances are cloud as well. Take all of the tenants on a cloud who are mixed across physical hosts, reshuffle them so they don’t share hypervisors. No customer’s cost economics change, no APIs change, no architectures change. Where your VM changed and the cost economics for the provider changed around unused resources (hence AWS’ per region charge).